This ultra-lightweight water based serum containing hydrating hyaluronic acid and skin balancing rose geranium gives the skin a mega moisture boost. Layer under your moisturizer or oil serum to cool and calm the skin immediately. The product itself is lovely; the only quibble I have is with the shipping cost, which at $15 adds significantly to the overall price. Hi Alanna, Thank you for your feedback, shipping is a tough one. I do have to charge a $10 flat fee for shipping on orders under $75 as Canada Post charges are so high. At $10 I am subsidising what Canada Post charge me (the amount depends on where I am shipping to). Hopefully as my company grows I will have cheaper shipping options available to me which I will pass on to you. Good things come in small glass bottles! 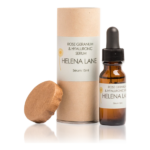 The Rose Geranium & Hyaluronic Serum is subtle, but it brings immediate moisture to the skin. I started out with two drops but have parred down to one only a few months into my Helena Lane skincare regimen. A little goes a long way. I use it in the morning before my moisturizer. All the products, however subtle, have a purpose and all seem to flow together to release a glow and vitality to the skin. Thank you for making it subtle and simple Helena! 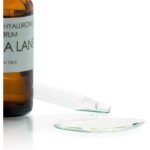 I adore the hyaluronic water serum! At night after cleansing, I mist with the flower water then use one drop of the serum and gently pat onto my face and my skin feels so smooth and soft! Thank you Helena for a gorgeous product! Your whole skin care line and philosophy is incredible!! This serum pairs wonderfully with my Argan & Frankincense Serum or Argan & Rosehip Moisturizer.